Like most men, my Husband is always craving something hearty and meaty for Dinner. We are a family of 6 and on the constant go for most of the school year due to football and basketball games so I rely on my crockpot to help satisfy my families tummies A LOT! 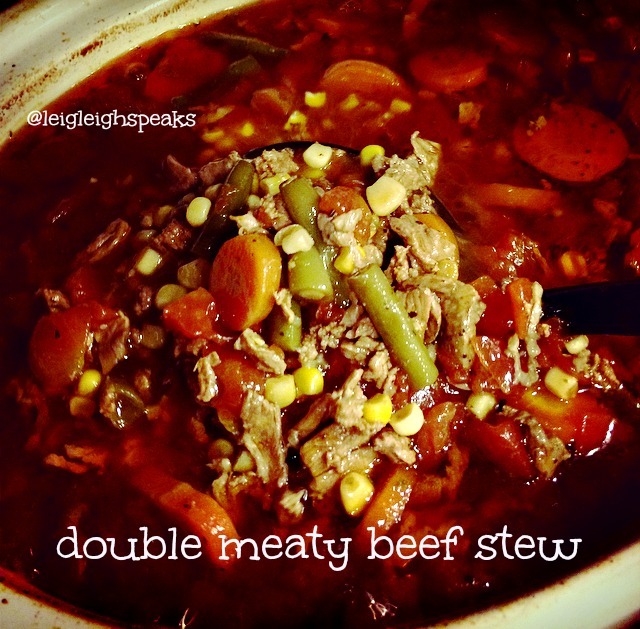 This Double Meaty Beef Stew is slow cooked all day long in the crockpot, which makes meal time prep a swift breeze! So let’s get right to it shall we? Instead of regular stew meat you pick up at your local grocery store look for thinly sliced Carne Picada Extra Thin. It is over there by the stew meat. I found it at WAL-MART. To make this recipe double meaty we are going to add hamburger meat as well. Heat coconut oil in your skillet on Med-High Heat. Lightly flour the Carne Picada Extra thin meat and brown in skillet. Set aside, do not drain. Brown ground beef in separate skillet. Do not drain. Empty all your canned veggies, stewed tomatoes, and potatoes into your crockpot. 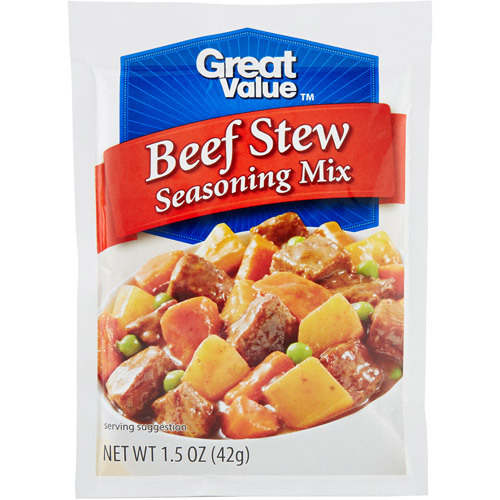 Empty Beef Stew season packets into crockpot. 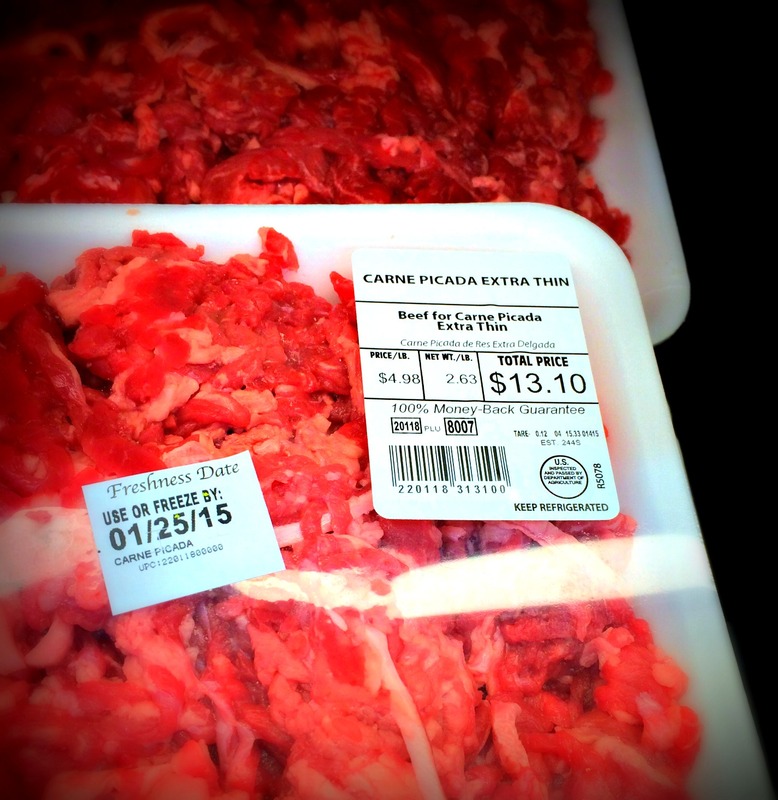 Empty your Carne Picada and your ground beef into crockpot. Now take a look and see if your stew level is lower then the fill line of the crockpot. If it is, add water until you get it to the top! Slow cook on High in crockpot for 5-6 Hours. Empty in big bowls and enjoy! We love to eat our Double Meaty Beef Stew with some yummy sweet cornbread! 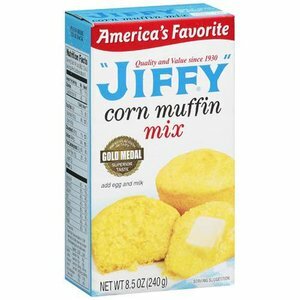 I use the Jiffy Cornbread Mix! I follow the directions on the box for my cornbread, but to make it sweet I add a half cup of sugar into the mix. I have to use two boxes because of my family size so I end up adding a full cup of sugar to the cornbread mix before I bake it as the box instructs! How do you make your Beef Stew? What are some tips or tricks you have learned to make it more hearty? 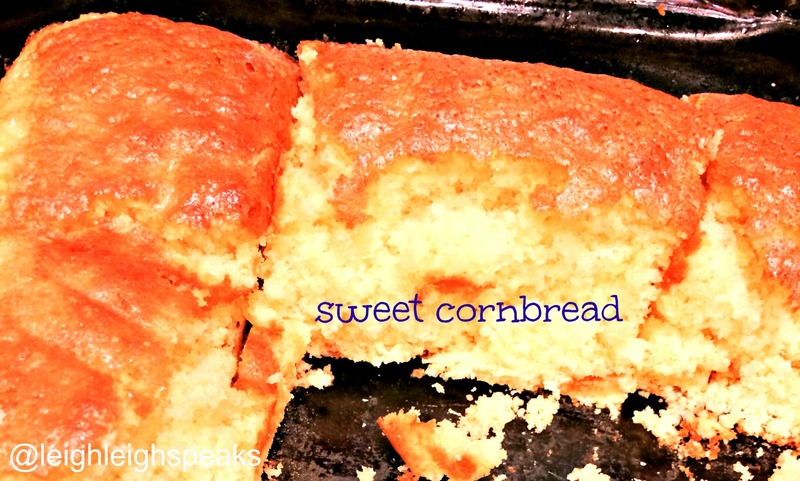 Have you ever tried sweet cornbread? Thanks for reading! I use it for my skin too! Love me some coconut oil!